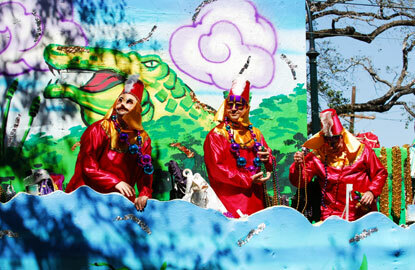 Parades and the revelry of Mardi Gras has attracted tourist and visitors from all over the world. Make sure you don’t break any of the cardinal rules of Mardi Gras. First timers may not know the traditions, but this quick primer will help you weave your way from parade route to parade route, no matter if you are in New Orleans, Mobile, or Galveston. Mardi Gras translated means Fat Tuesday. It originally began as a Catholic celebration day to enjoy the things that a person would give up during the Lenten Season. Lent, is the 40 days before Easter that symbolizes the time Jesus spent fasting in the desert before his arrest and crucifixion. Catholics fast on certain days and also give up something that is important to them. Many people give up candy, others quit smoking, and some people try to give up relations (if they aren’t married). It starts on Ash Wednesday, the day following Mardi Gras. Through the years, the celebrations have expanded from one day to an entire season, consisting of weeks of revelry beginning on The Epiphany, or Twelfth Night. Mardi Gras dates vary from year to year. Many revelers will argue that there really are no rules to Mardi Gras. As a lifelong resident of South Louisiana, I beg to differ. There are rules, and then there are the RULES. The King Cake Rule: I can give a detailed explanation about the origins of the King Cake, but that might be boring. Suffice it to say, the King Cake is a big round cinnamon roll topped with icing and colored sugar. The colors are green, purple, and gold. A plastic or gold baby is placed inside the delicacy, so be careful when you take a bite. You don’t want to break a tooth. If you get the baby inside your slice, guess what? YOU get to buy the next King Cake. And don’t try to slip it back inside the King Cake when no one is looking, because Karma will come back and get you in the form of an party-goer who will regurgitate on you at your next parade. The Parade Rule: There are invisible lines surrounding the area of a family who has staked out their spot on the parade route. Do not think that you can wait until the parade starts to stand in the area in front. You will get injured by an inebriated mother wearing a feather boa should you block her child’s area of the curb. Your lesson: Get there early and find your own spot. The Bead Rule: There are beads and then there are “good” beads. When good beads are being thrown, get out of the way unless the person on the float makes eye contact. Yes, this is the Bead Rule. Eye contact and pointing means the person throwing the item will aim for you. Oh, and don’t catch beads intended for a child. Should you make contact with these beads, then act like you “meant” to get it for the kid, and then hand it off to them. The Don’t Be Offended Rule: Mardi Gras is considered a family event in many areas, however, this does not lesson the satire or adult tones of parades. If you are easily offended, just don’t go. You will see the obligatory family ice chest filled with beer and juice boxes. Every once in a while someone still flashes “the girls” so don’t look or at least be aware of your surroundings during the parade, keeping your hands ready to block a view from your child’s eyes. Stay away from Bourbon Street and find the family areas along a parade route. The No Business Rule: Mardi Gras is an official state holiday in Louisiana, so don’t even try conduct business with someone from that state from the Saturday before Mardi Gras through the afternoon of Ash Wednesday. These are just a few of the rules of Mardi Gras posted for your entertainment and education. Any additional rules can be posted in the comments. And remember, if you attend a Mardi Gras parade, the ultimate rule is to HAVE FUN.